Nanofibers are a flexible material with a huge range of potential applications in such areas as technical textiles. Functional nanofibers and their applications summarises key trends in the processing and applications of these exciting materials. Part one focuses on the types and processing of nanofibers. Beginning with an overview of the principles and techniques involved in their production, it goes on to review core-shell, aligned, porous and gradient nanofibers. The processing and application of composite functional nanofibers, carbon and polymer nanofiber reinforcements in polymer matrix composites, and inorganic functional nanofibers are then explored in detail, before part one concludes with a consideration of surface functionalization. A wide variety of functional nanofiber applications are then reviewed in part two. Following consideration of their use in filtration, drug delivery and tissue engineering applications, the role of functional nanofibers in lithium-ion batteries, sensor applications, protective clothing, food processing and water purification is explored. Discussion of their use in sound absorption, electromagnetic wave attenuation and biomedical and microelectronic applications follows, before a final discussion of future trends. 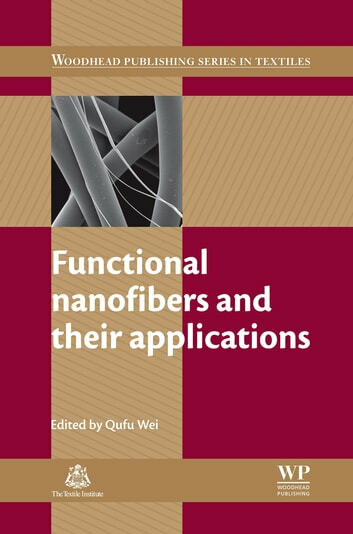 With its distinguished editor and international team of expert contributors, Functional nanofibers and applications is a key text for all those working in the fields of technical textiles, as well as areas using nanofibers such as composites, biomaterials and microelectronics.